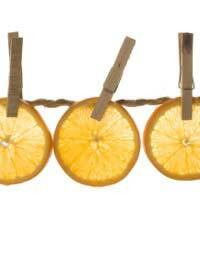 Home > Ask Our Experts > How do I Dry Citrus Fruit? I would like to dry my citrus fruit such as limes, lemons and oranges. Is it possible to dry citrus fruit for human consumption? If so how do I dry citrus fruit? It is possible to dry citrus fruit – but usually only the peel. That’s because the flesh is too juicy and soft to dry well: you’ll be left with a chewy husk. Better options would be to preserve or freeze the citrus fruits. The citrus peel will, however, dry beautifully, and you can then store and use it in cakes and Moroccan stews. Freeze in syrup Orange (or lime or lemon) segments can be frozen, and they’ll keep better if you pack them in a sweetened syrup. The sugar preserves the plumpness and colour of the segments. To preserve them in this way, pack peeled orange segments into containers – sturdy glass or plastic, freezer-proof containers work best – then make a syrup using fresh juice or water (2 parts sugar, 1 part water) and pour it carefully over the top. Allow 1cm (per pint) space at the top of the container, seal, and put into the freezer. NOTE: Some citrus fruits, such as Navel oranges, become bitter when subjected to freezing (caused by compounds in the peel). It’s wise to test this technique using one fruit before storing all of your citrus in this way. If the fruit doesn’t respond well to being frozen, you could squeeze and freeze the juice only in ice-cube trays, and dry the peel (see below). Preserve in salt This technique is used for lemons and limes, and it’s prevalent in Middle Eastern countries, where lemons in particular are used in savoury dishes. Quarter the lemons, squeeze out the juice, and put the shells into a dish with sea salt (a handful for every ten lemons); using your hands, rub the salt into the lemon flesh and skin. Sterilise a large jar and pack in the lemon quarters, adding all of the salt in layers; then cover with the lemon juice and seal. To use in stew, remove any remaining pith from the lemon peel and dice it finely. Dried citrus peel Carefully peel the citrus fruits, removing any pith from the inner layer, and slice into strips. You can dry either in the sun – on a baking tray, and protected by a fly cover – or in a very low oven. Store it in an airtight jar in a dark, cool cupboard. Use the dried lemon peel in baking or Martinis! Espalier Pear Tree Losing Fruit: What is the Cause? Kiwi: Do I Need Male and Female Varieties to Bear Fruits? Can I Save My Orange Tree? Why do we not hear about Winberries? What is the Best Plum Tree for a Small Garden?